The U.S. has more foreign students enrolled in its colleges and universities than any other country in the world. Explore data about foreign students in the U.S. higher education system below, and read the accompanying blog post, “New foreign student enrollment at U.S. colleges and universities doubled since Great Recession,” for more information. 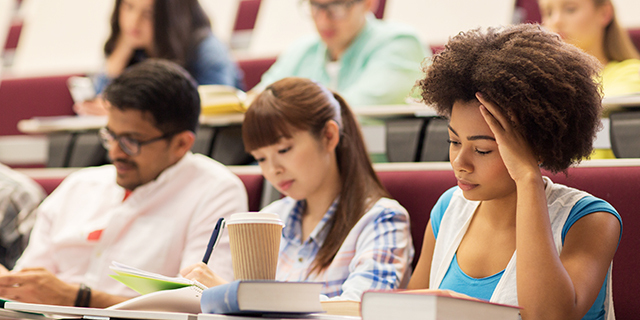 The most common type of foreign student visa is the F-1 visa, and these are typically given to those pursuing college degrees. The number of newly enrolled foreign students with F-1 visas at U.S. colleges and universities has grown dramatically, increasing from 138,000 in 2004 to 364,000 in 2016. Much of this growth has happened since the start of the Great Recession. Since the Great Recession, new foreign student enrollment has grown faster at public colleges and universities than at private institutions. The number of foreign students pursuing associate and bachelor’s degrees at public universities grew faster than at private schools, while graduate degrees (master’s and doctorate degrees) grew slightly faster at private institutions. Master’s and bachelor’s degrees are the most common degrees pursued by newly enrolled foreign students in the U.S.
Men have accounted for a majority of newly enrolled foreign students at U.S. colleges and universities since 2004. Students from China, India and South Korea accounted for more than half (54%) of all newly enrolled foreign students pursuing degrees at U.S. colleges and universities in 2016. Ten states accounted for nearly two-thirds (63%) of newly enrolled foreign students at U.S. colleges and universities in 2016. This fact sheet was compiled by Abby Budiman, intern, Jynnah Radford, research assistant, Antonio Flores, research assistant, and Neil G. Ruiz, associate director of global migration and demography research. The data in this analysis include only students with F-1 visas newly enrolled at U.S. colleges and universities who appeared in the federal government’s automated foreign student monitoring system, the Student and Exchange Visitor Information System. These students must be enrolled full-time at U.S. colleges and universities certified by the federal government. Public and private schools are defined by the Carnegie Classification of Institutions of Higher Education. This analysis excludes schools not categorized in the Carnegie classification system. For this analysis we assume students approved for F-1 visas enroll for studies at their sponsoring school.